The public transport in Ghent is extensive. The city of Ghent and ‘De Lijn’ work really hard to make the city centre as accessible as possible. That’s why most of the sport facilities will be located around bus and/or tram stops. The participant card will be valid as public transportation ticket. If you stay in or around the city centre, we suggest you to come by foot. Fast and cheap? One answer: by bike. If you want to plan your own, personal, bike route, check out the bike planner by the following link: http://fietsrouteplanner.gentfietst.be. The bike planner is a digital map, comparable with a GPS-system. Set your point of departure and your point of arrival, click the button and a few seconds later your route appears. You’ll find two bicycle parkings in the Historical Centre of the city. Both parkings a free and camera-secured. They open at 7 a.m. and close at 1 a.m. every day, with the exception of Friday and Saturday when they close at 3 a.m. . The bicycle parking ‘Korenmarkt’, underneath the ‘Sint-Michielsbrug’, can stall 210 bikes. You can enter the parking at Pakhuisstraat, next to the old post office. The bicycle parking ‘Braunplein’, underneath the city hall, can stall 80 bikes. This parking has a Max Mobiel bike point where you can rent bikes, register your own bike for free and carry out minor repairs. You can enter the bicycle parking through the ‘Green’ at Emile Braunplein. Every participant receives an accreditation pass at the registration in the meeting centre. This pass is your ticket for De Lijn in East Flanders. It allows you to make use of all buses and trams for free during the European Company Sport Games. Visitors can buy a 5-day-pass. This pass offers you unlimited access to all buses and trams. It costs 17 euros and you can only buy them at a ticket machine or ‘Lijnwinkels’. These ‘Lijnwinkels’ in Ghent are located at Ghent Sint-Pieters station, Korenmarkt or Ghent South. The standard rates of De Lijn apply to every line, including night lines. Save time ! Buy you ticket by sms or m-ticket before you get on. An sms- ticket costs € 2 + € 0,15. SMS ‘DL’ to 4884. An m-ticket only costs € 1,80. You can buy it through the app of De Lijn. Both tickets are valid for 60 minutes. Plan your own trip through the route planner of the app of De Lijn. If you want real-time information about your bus or tram while waiting at the stop, you can go to www.delijn.be and fill in the name or number of your stop in the search engine. Handy! Even if it gets really late, you can still go back with the night lines. These 8 night buses follow the same route as during the day and have the same number but with an ‘N’ in front of it. You can hop on/ off wherever you want in the city centre. If it is passed 11 p.m. at a terminus and you want to go to the city centre, you can take the night bus to the city centre bus the bus does not stop at every bus stop. You can only hop on at a bus stop outside the city, if the bus drives city outward. Underneath ‘Vrijdagmarkt’ you’ll find 648 parking lots, among which 8 lots for people with disabilities. This parking is located nearby Korenmarkt and Sint-Jacobs. Parking garage Reep is located at Seminariestraat. This parking has 484 parking lots among which 10 lots for people with disabilities. You can also find 2 charging stations for electric cars in this parking garage. Located at Savaanstraat nearby Veldstraat and Kouter. There are 588 parking lots among which 4 lots for people with disabilities. This parking is located nearby Sint-Michiels, Graslei and Korenmarkt. There are 280 parking lots among which 13 lots for people with disabilities. This parking counts 700 parking lots among which 9 parking lots for people with disabilities. You can also find 2 charging stations for electric cars in this parking garage. This parking is located underneath the Ghent-South shopping centre and the public library. There are 1034 parking lots among which 2 lots for people with disabilities. This parking has 425 parking lots among which 8 for people with disabilities and 1 with a charging station for electric cars. This parking is located nearby Veldstraat and counts 532 parking lots. This parking counts 1580 parking lots among which 47 for people with disabilities and 6 Cambio lots. Coming from Antwerp (E17): Exit R4/ Expo- The Loop at Zwijnaarde and follow ‘Expo- The Loop’. Coming from Kortijk (E17): go to E40 direction Ostend and follow ‘Expo- The Loop’. Coming from Brussels or Ostend (E40): exit 14 direction ‘Expo- The Loop’. The free car park is located between Ikea and Flanders Expo. Continue you journey towards Korenmarkt through Ghent Sint-Pieters station with tram 1 of night bus N1. Coming from Melle: turn right at the traffic lights underneath the overpass of exit 10 of the E17. Continue your journey with tram 21 or N21. E17 exit 10, at N9 direction Melle. Continue your journey with tram 21 or N21. Coming from R4: exit 3 ‘Oostakker’. Follow N70 (Antwerpsesteenweg) direction Ghent. P+R at the shoppingcentre, at Oude Bareelstraat. Continue your journey with lines 17,18 and 76,77 and 78. At night, you can take the N17 line. Next to the free P+R possibility’s, as suggested above, you can also use the underground parking at Ghent Sint-Pieters station. This parking has 1580 parking lots among which 47 lots for people with disabilities, 9 Cambio lots and 6 lots with a charging station for electric cars. The station is served by all the centre lines and nightlines N1, N4, N21, N70 and N76. GPS coordinates for the parking entrance: 51.036135; 3.704544 – Ghent Sint-Denijslaan. The underground parking is directly accessible from the R4 around Ghent through Valentin Vaerewyckweg and Timichegtunnel. 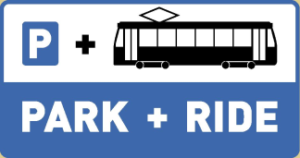 Another B-parking is the P+R Galveston (250 parking lots). You can continue your journey with lines 55,57 and 58. Around the pedestrian zone, nearby the city centre, you can find a number of free parking lots for people with disabilities only, even if it’s located in the blue or pay zone. Free parking doesn’t count in the underground parking. Attention: with a parking pass for people with disabilities, you may not park at the reserved parking lots for residents. A taxi can drive you home safe at a moderate rate.